How Much Protein Is in the Egg Yolk vs. the Egg White? The egg white has been promoted as the healthier part of the egg, leaving the yolk behind. As it turns out, though, you're probably better off keeping the yolk in. 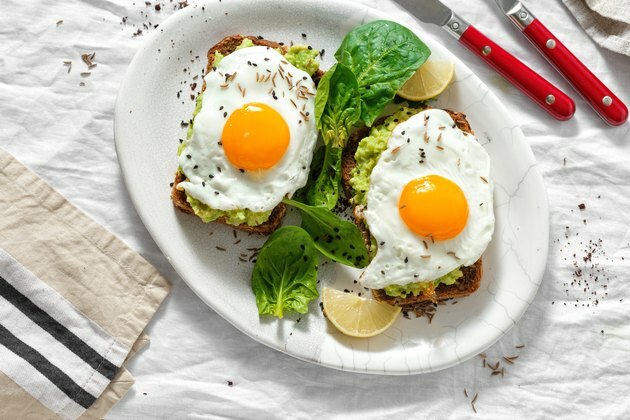 Although the egg white is seen as the primary protein source, the yolk has more protein by weight and plenty of vitamins and minerals to go along with it. There's more protein in the egg white than in the yolk because the egg white makes up the bulk of the egg. For decades, dietary fat was vilified, and then, carbohydrates began taking heat as the least healthy of the three macronutrients. Egg yolks contain all the fat in eggs, but the egg white is a purer protein source. More fat in the yolk subsequently means there's more flavor. Egg whites and spinach in an omelet is more bland compared to a regular omelet with the yolks left in. Many people are willing to sacrifice on flavor for the perceived health benefits. Not only are the yolks higher in fat, but they're higher in dietary cholesterol as well. Read more: Are Egg Whites Healthy? Previously, it was generally accepted that more cholesterol in your diet meant more in your body, eventually leading to an increased risk of heart disease. More recently, research has shown that there's a weak correlation between how much cholesterol you eat and how much you retain, according to an article from the Harvard T.H. Chan School of Public Health. As it turns out, saturated fat and trans fat are bigger contributors to your cholesterol level. Egg yolks contain mostly monounsaturated and polyunsaturated fats, which are considered "good" fats. Unless you're genetically predisposed to have high cholesterol, eating egg yolks is fine. Besides the perceived health benefit of eating only egg whites, it's thought that most of the protein in the egg is stored there. In fact, only slightly more than half of the protein in an egg is stored in the egg white, while slightly less than half is in the yolk. In other words, according to an article from the North Carolina Egg Association, they're about even. In fact, there's more protein in egg yolks per gram than in egg whites. In 100 grams of egg yolk, there are almost 16 grams of protein, according to the USDA National Nutrient Database. In comparison, there are only about 11 grams of protein per 100 grams of egg white. Most eggs contain more egg white than egg yolk, though, which explains why, in one egg, there's more protein in the white than in the yolk. If you're looking to build muscle, you need to eat the egg yolk. A study conducted by researchers at the University of Illinois showed that combining egg yolks with egg whites resulted in 40 percent more muscle gain than consuming the same amount of protein from egg whites only. The researchers weren't sure how adding yolks helped. It wasn't the fat content of the yolks that made the difference, because other studies that added fat to isolated protein sources saw no difference, according to the article. There's no clear explanation of why the yolk helps; it's simply known that the egg white has fewer nutrients. Yolks are much higher in B vitamins, folate, and vitamins A, D and E. Since they're more nutrient dense than the egg white and much tastier, it's better to keep them in your meal. Read more: What Are the Benefits of Egg Yolks? How Many Eggs Can I Eat a Day Without Adverse Effects?